Flowerdews on the town square – a new project? The Deputy Mayor has asked if we would be up for a challenge! 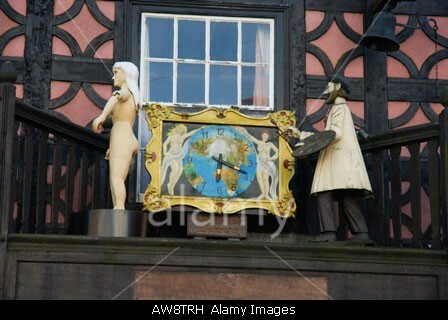 In 2000, in the town square, there was installed a rather clever clock. 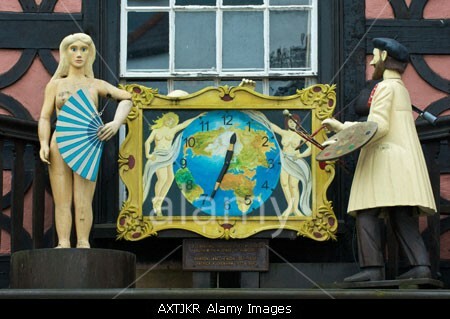 With three figures, a woman with a fan to protect her modesty, an artist painting, and a peeping tom, linked to a powered mechanism and with the clock in the centre, it could be programmed to move when the clock chimed. 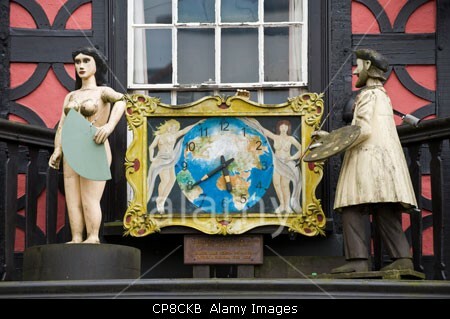 For 12 or 13 years it did this daily, drawing crowds, & people still appear from time to time looking for the clock. So today I have spoken to Ray at Flowerdews about where things currently are. 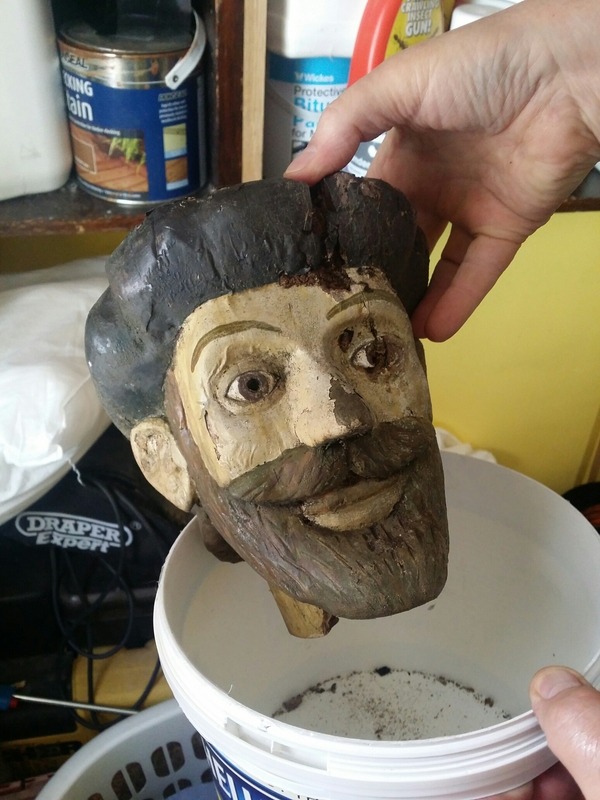 I now have the two heads (or what remains of them) & several photos of the bits that remain. 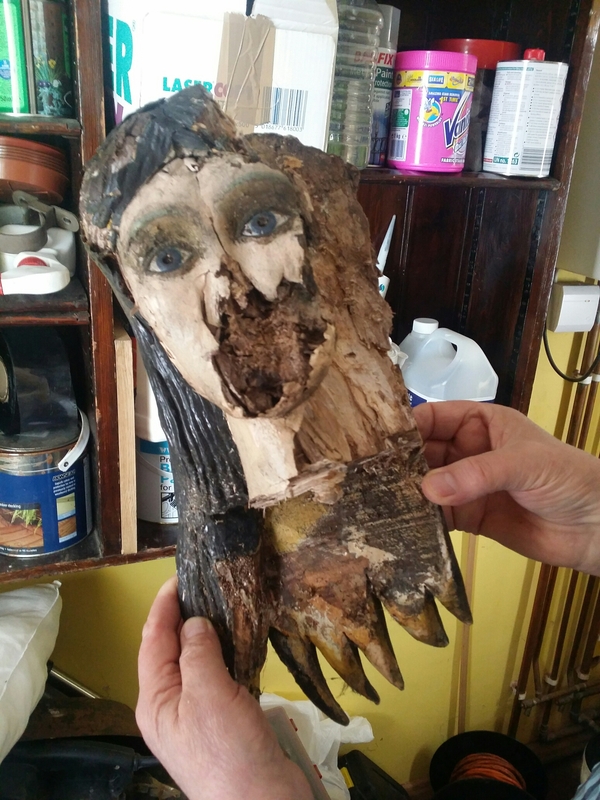 The bodies were hardwood, & are largely intact, but the softwood heads have, er, well, you can see for yourselves! He’s looking a bit better than she is! The mechanism was pretty simple, but alarmingly seems to have been mains voltage, in wet wood! When the time signal was sent through, the chimes played and the system went into action, apparently controlled by two microswitches in the clock mechanism, which simply switched mains voltage to the motors, driving everything on a relatively simple mechanism. Can we fix it? Probably. Can we improve on it? Come along on our Thursday open nights and find out how! Please join our forum to talk about this exciting project! http://forum.makebromyard.org.uk/viewtopic.php?f=5&t=33&p=148 is the direct link to this topic. Starting to look a lot like… Well, not Christmas!